Max Youngs was a 2013 recipient of the David and Stephen Grubbs Fellowship for Summer Undergraduate Research. 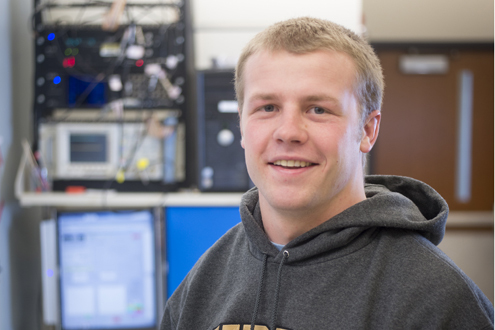 While many college students returned home last summer and worked odd jobs that likely had little to do with their aspirational careers, Weldon undergraduate student Max Youngs stayed at Purdue and worked as a researcher on a technology that may one day appear in a clinical setting. Youngs was a 2013 recipient of the David and Stephen Grubbs Fellowship for Summer Undergraduate Research. The fellowship enables students to live on campus over the summer and participate in research under the tutelage of a faculty member. It is designed to give students a close look at a career in research at a very early stage in their academic tenure, an experience that is being fostered in greater numbers than ever at the Weldon School. Youngs worked with Kevin Otto, an associate professor of biomedical engineering, on a developing technology that will aid patients with sensory loss. The technology might be used to provide visual feedback to the sight-impaired, for example. It could provide audio feedback for the hearing impaired or deaf patient if cochlear implants are not sufficient. “Perhaps the most clinically relevant application is for paralyzed or amputee patients,” Youngs said. “Cortical recordings enable patients to control robotic systems independently, such as a wheelchair or robotic arm. Cortical stimulation then provides the necessary feedback for these systems to become natural for the user.” For example, in the case of a robotic arm, users could feel the glass of water they are picking up to know how hard they are squeezing rather than relying on visual cues, which may make the process clumsy. The Grubbs fellowship was established by brothers Stephen and David Grubbs in hopes of inspiring undergraduate students to explore possible career choices in biomedical engineering. Both brothers had summer research experiences while undergraduates at Purdue that left indelible impressions upon them. For more information on the Grubbs brothers and their inspirational story, read an Imprints article from 2010.